Janet won the People's Choice TWISI Award for Outstanding Achievement on a CD by a Female Theatre Artist. Recorded in studios in Toronto Ontario, Halifax Nova Scotia and Edmonton Alberta. Music producer and multi-platinum selling Juno Award and American Music Award winning singer/song writer Alfie Zappacosta brought some of the best session players in the country together to play on this adult contemporary smooth jazz CD which features new releases penned by Alfie Zappacosta, "Oz", "Eden" and "Here For You", as well as covers of AZ's "Hills of San Sebastian", "Next To You" and "The Dance Is Over". Lisa-Catherine Cohen (of David Hallyday's French Billboard #1 hit "High" fame) with co-writer David Pomeranz (who wrote "Tryin' To Get the Feelin' Again") contributed the new release, "It's All Alright". The poignant "Something I Thought I'd Never Do" written by NYC composers Judy Barron and Jeffrey D. Harris, an inspired version of Joni Mitchell's "Blue", and the new release of Canadian theatre composer David Warrack's, "Please Leave Me Love", as well as two new songs by MacEwen round out this recording. on viola and accordion, and Silvio Pupo on keys, with special guest appearances by Ross Billard on piano, Dennis Keldie on Hammond B3, and the one and only AZ on guitar. With lush string arrangements thanks to Mike Stanutz @ Mist Productions. Back Alley Music - University Avenue. 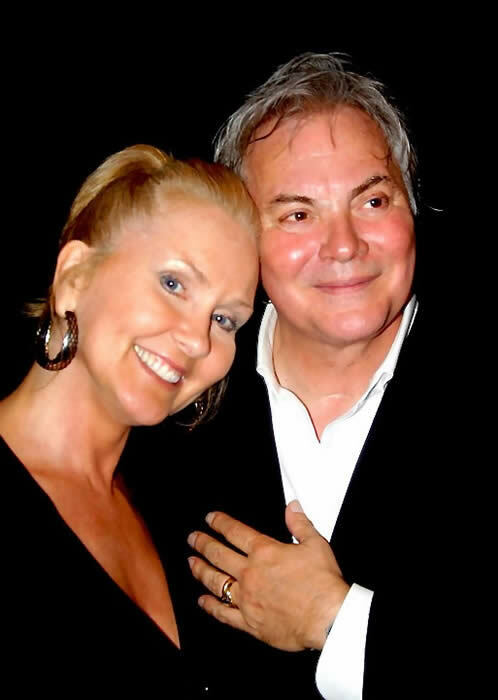 Charlottetown – "International award winning Jazz singer/songwriter, Alfie Zappacosta and well known singer/actress, Janet MacEwen, bring their smooth jazzy tones to The Guild on Monday, July 19 @8 PM. Janet MacEwen opens the evening and is sure to recreate songs from her recent CD "Back Where I Belong". It was nominated for three 2009 Music PEI Awards, including Female Vocalist of the year. Janet sang at the 2009 PEI Jazz and Blues Festival and is also known to PEI audiences for her musical theatre role as Marilla in “Anne of Green Gables" @ The Ch'town Festival as well as for her energetic hosting of Late Night @ Mavor's." "... very much a polished effort..."
"For the past 3 seasons Janet MacEwen has endeared herself to audiences with her performances as Marilla Cuthbert in "Anne of Green Gables". But offstage the Nova Scotia native has been building a reputation for herself as a singer with serious chops and a repertoire that would leave some ladies of Avonlea flapping their fans and clutching their hearts. BACK WHERE I BELONG, MacEwen's debut CD, will, I suggest, take many by surprise. There are several reasons for that, not the least of which are the album's production values. Unlike most first records which sound a little rough around the edges, BACK WHERE I BELONG is very much a polished effort, owing in part to the fact MacEwen enlisted the services of a friend and sometimes collaborator with serious credentials to produce the album, Alfie Zappacosta. And Zappacosta's contribution to the album did not end there. He played and sang on the record and contributed 6 songs to the mix which he either wrote or co-wrote, including three of the record's finest tracks, "Here For You", "Hills of San Sebastian" and "The Dance Is Over". MacEwen herself penned two songs for the album, "Last Christmas Wish" and what is perhaps the album's best track, the bittersweet, "I've Never Really Known You". The remaining material came from a variety of sources, most notably Joni Mitchell, whose "Blue" is served well by an arrangement that features only MacEwen's voice and the sound of waves breaking against the shore. MacEwen chose her material very well. There isn't anything here that doesn't suit her voice. Then again, with her voice there isn't a lot of material that's out of reach. The arrangements are gorgeous and the sidemen she used here are all first call players: keyboard player Silvio Pupo, drummer Blake Manning, B3 player Dennis Keldie, accordion player Claudio Vena and bass player Russ Boswell. Prime cuts include "Oz", "I've Never Really Known You", "Blue", "Here For You" and "It's All Alright"
"I have had the supreme pleasure of listening to your marvellous CD many, many times and I'm crazy about it! What a superb piece of work. You should be very proud. It's beautifully thought out, magnificently crafted, and delivered with great passion and professionalism. Perfect choices of material... and never predictable. It's a huge accomplishment by a gifted artist with wonderful and always totally dead-on accompaniment. It deserves huge exposure. [Janet] is indeed a treasure." "… Wow! I just had a listen to your CD and I was absolutely blown away. The theatrical singers out there who try to cross over to jazz and pop, and from time to time there are pop and jazz singers who experiment with the theatrical canon but most seldom succeed. But you… you traverse those bridges so naturally and with such great ease that your CD should be required listening to hear how it's done right and proper. Alfie is a wonderful lyricist, and he is blessed to have someone like you to interpret his musical thoughts so wonderfully. You guys have got to do another CD together! 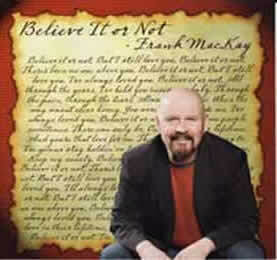 I haven't heard a better one-two punch since the early Bacharach/Warwick days." 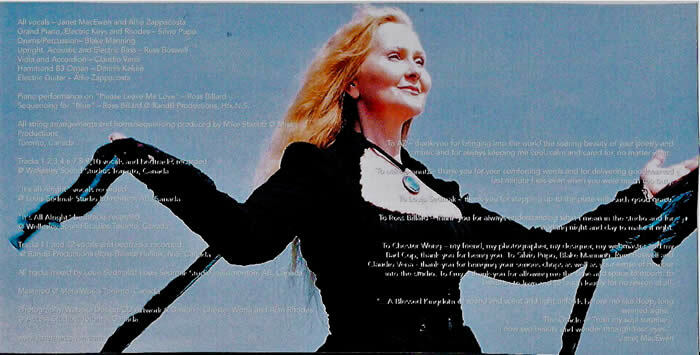 Janet recorded award winning musical theatre composer David Warrack's heartfelt ballad, My Prince Edward Island in May 2008 at Saluki Music Studio in Toronto. My Prince Edward Island was released at the annual Maud Whitmore Scholarship Fund Concert w/ the full Ch'town Festival Orchestra in August 2008. 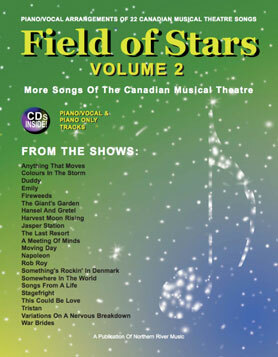 The CD is available for purchase @ The Showcase Gift Shop in The Confederation Centre in Charlottetown, PEI. Janet on stage for this intimate release concert @Statler's Lounge in Toronto. eyes off her and that voice stays with you and brings you back again and again. The voice, the emotion, the arrangements.... it's all right there. Janet is a force." ... loved loved loved seeing [Janet], oh my God! SO GREAT!" her considerable poise on stage... She is a stunning vocalist and truly a musical find." " ... Spell binding performance!" by a polished performer with gorgeous accompaniment - Beautiful." and before we knew it, it was over!! …"
"...I was thrilled to hear your voice. ..You sing like an angel... "
as I’d love to come see/hear you..."
totally impressed. And my favorite cut is #2 "OZ". Listened to it 4 times. WOW. Thanks for the lift, kiddo. Oh, you can keep "warming up" if you like, altho you obviously don't need to; angelic voce." love your two songs. What a beautiful gift to share with the world." "...[Janet]sounds fantastic!!!! I LOVE 'OZ' ... beautiful!!!!" the tune. And your own song ("I've Never Really Known You") I listened to a half-dozen times in a row. Unbelievable, Janet." tasty arrangements, classy playing, luscious vocals, and SO much heart. mom is devastating . It's gorgeous Janet."